15. Girl. Enjoying life. Big fan of fantasy. Grateful for friends and family. We touched down at Christchurch international airport as schedule at about 6.30pm yesterday after a whole day of flying. As instructed, we keyed in no "25" at the phone just before the exit of the airport. We were told to wait for the van to send us to depot to collect our car. With no hassle at all, we collected the car which we were quite happy with. 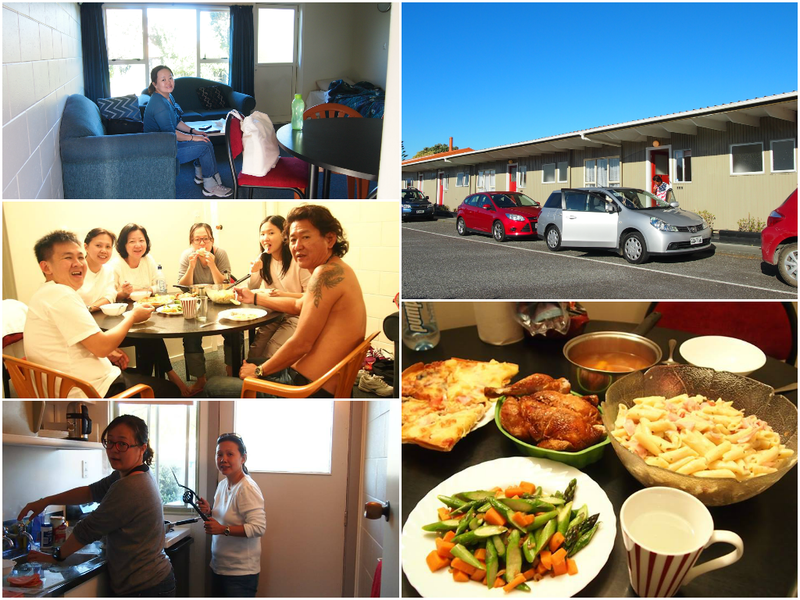 We then drove directly to Airways motel and had our dinner which was prepared by Tess. At night, we drove downtown to the city center. To our disappointment, the city was still very much in a state of "after-quake" with reconstruction work in progress everywhere. The area was deserted and the weather was very cold. The six of us in the deserted street in front of the damaged church! In the morning, after our breakfast in the comfortable motel, our journey started with everyone feeling really excited. Airways Motel, 2 bedrooms + 1 single bed + 1 sofa bed in the living room. Very comfortable. As agreed, Tess and Lai lead the way with their GPS which was already uploaded with the route. Pa only needed to follow behind. So we just sat back and relax. 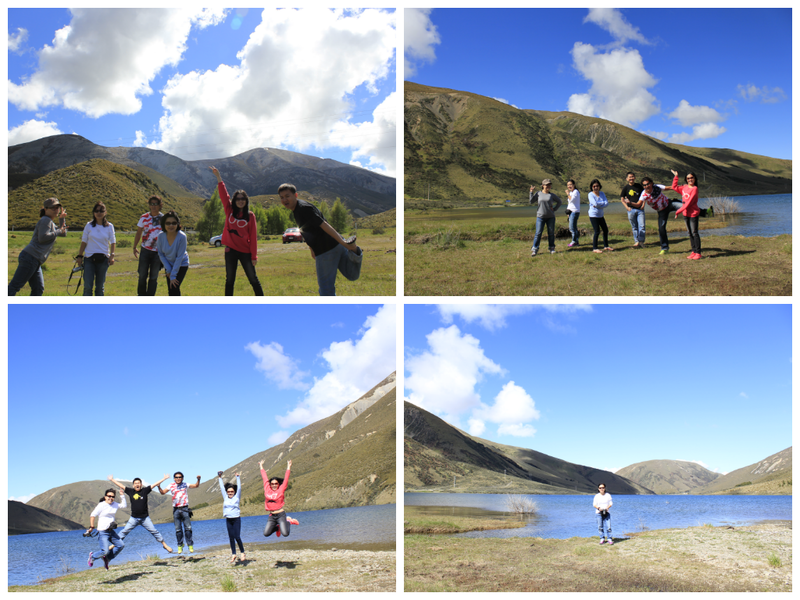 Once we were out of the city, we were immediately greeted with vast greenery with clear blue sky and pure white cloud, and of course SHEEPS! Yeah, this is New Zealand! Shortly, the Red Ford Focus signaled to stop and of course we followed suit. There was a lake with mountains as backdrop. It was beautiful! So peaceful and calm and NEAT. Just a random spot by the road and it's beautiful! The journey continued, about 1 1/2 hour later, we reached out first itinerary, the Castle Hill. 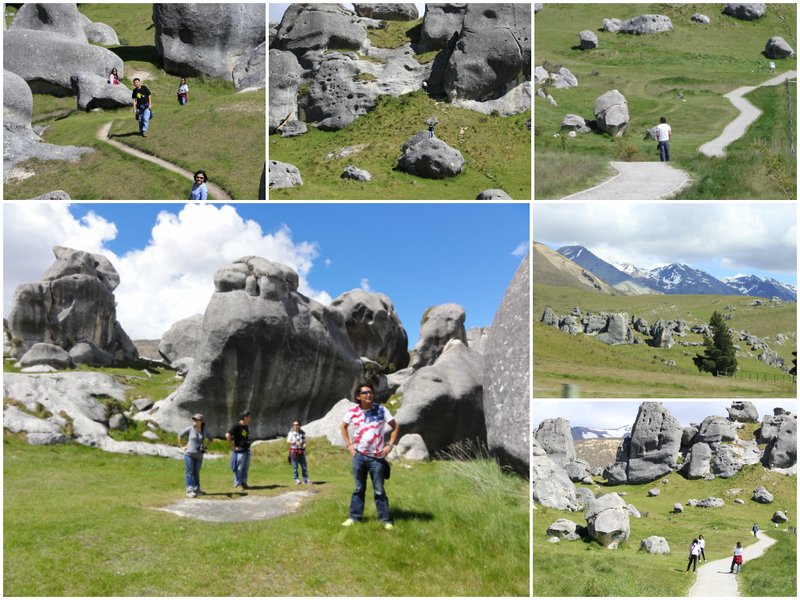 Along the State Highway 37, Castle Hill is a hill of about 700m high scattered with dark grey rocks of all sizes. We had a good time there. Tess and I at the top of the hill. Look how small the lane we walked down there! 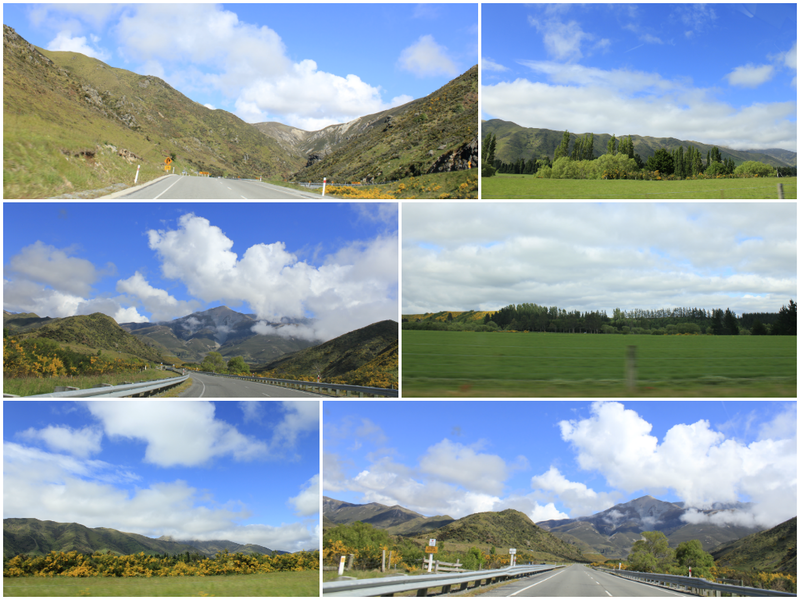 After that, about 1/2 hour journey, we arrived at Arthur's Pass where we stopped for photo and had our first glimpse of snow-capped mountain of NZ. We then had our lunch of pizza in a small restaurant. 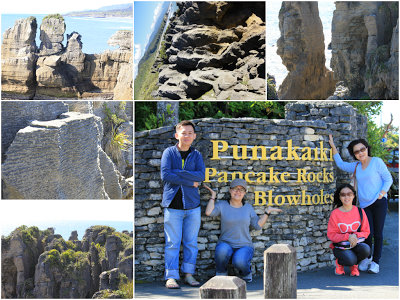 After lunch, we continued our journey to our last itinerary of the day, The Pancake Rock. 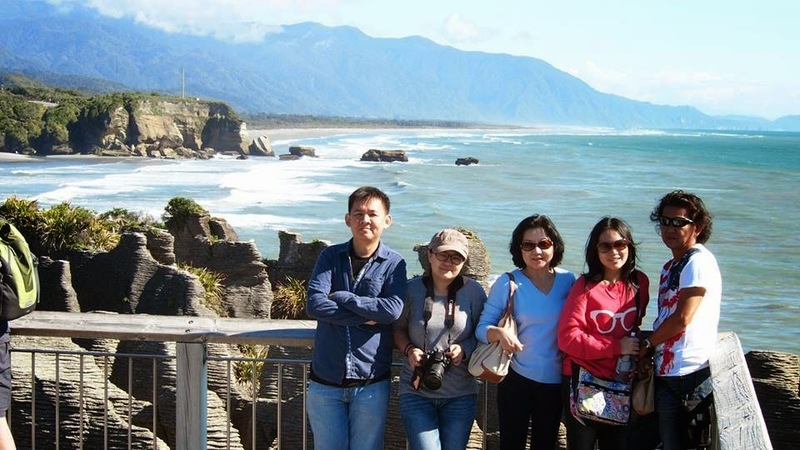 On the way, we passed by Greymouth which is on the west coast. We had already crossed from West coast to the East coast by now, facing the Tasman sea. We drove another 35 mins to the North and we were at Punaikaki for the Pancake Rock. The pancake-like rock formation is the result of limestone being compressed because of erosion. 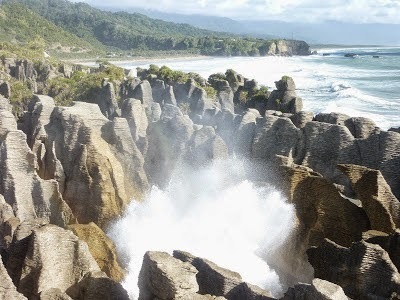 Unfortunately we missed the high tide and hence missed the spectacular sight of the sea water gushed through the hole. It's supposed to look like this when the tide is high! Sadly, this is what we saw. Neat layers of rocks overlapping ! After that, we drove to Greymouth, stopped for groceries. Then we proceeded to Hokitika and checked into the 252 Beach Motel where our 2 chefs prepared dinner and Mi and I had our showers. Dinner of Roast Chicken and pastas and veges, nice! 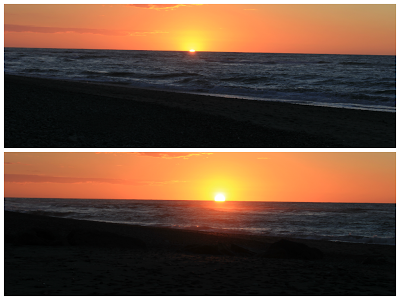 After dinner, we rushed to the shore which is just behind the motel to view the sunset of Tasman Sea. 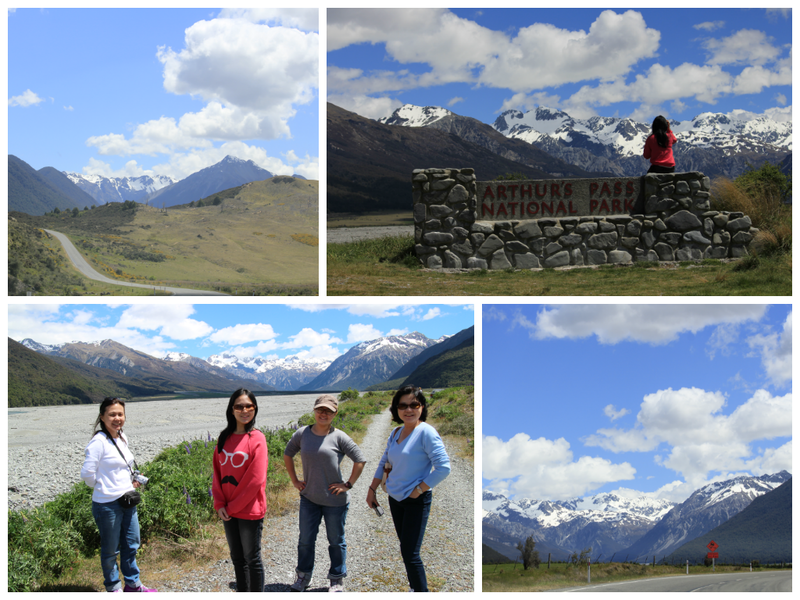 So this is our first day in NZ. Looking forward to our 2nd day, Fox Glacier, here we come! 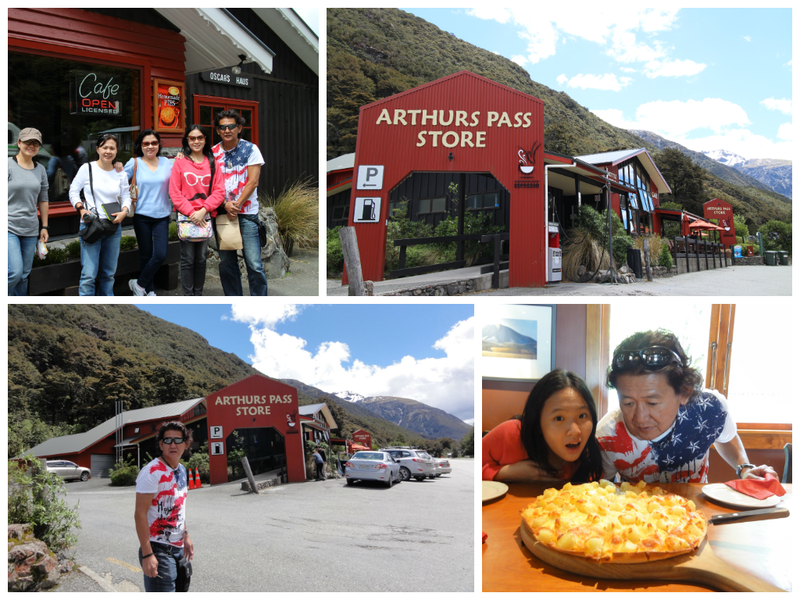 New Zealand trip! Home of middle earth! 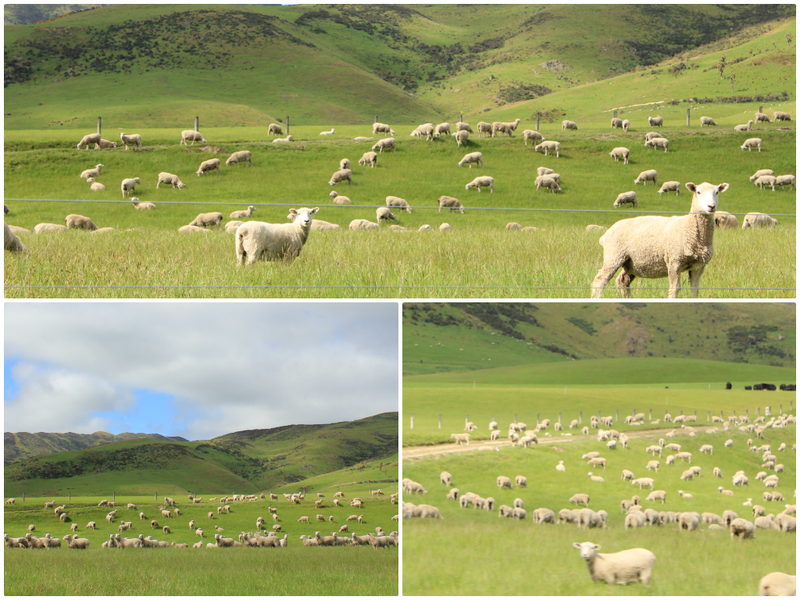 Ah, how I miss the cold breeze, fluffy sheep and those fat cows in New Zealand. 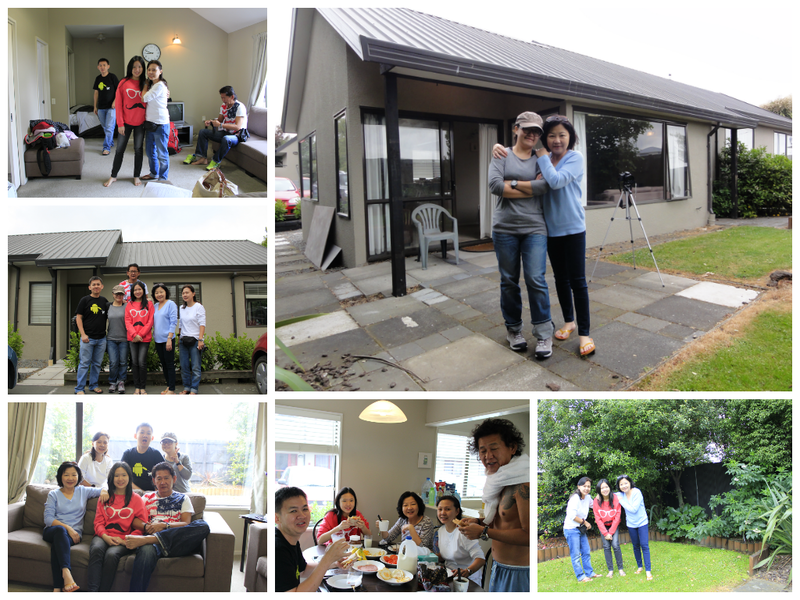 My family and I, along with my cousin and her husband, went to New Zealand for two weeks in Nov 2013. It was a painful 10.5 hours flight to Auckland followed by a domestic flight to Christchurch. 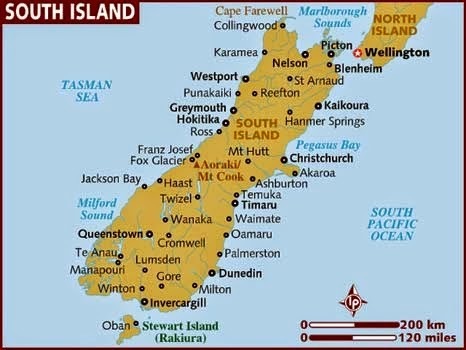 We travelled around the south island of New Zealand anti clock wise starting from Christchurch and ending in Christchurch too. Once again, Mi was the one behind the whole trip from planning to booking of accommodations. 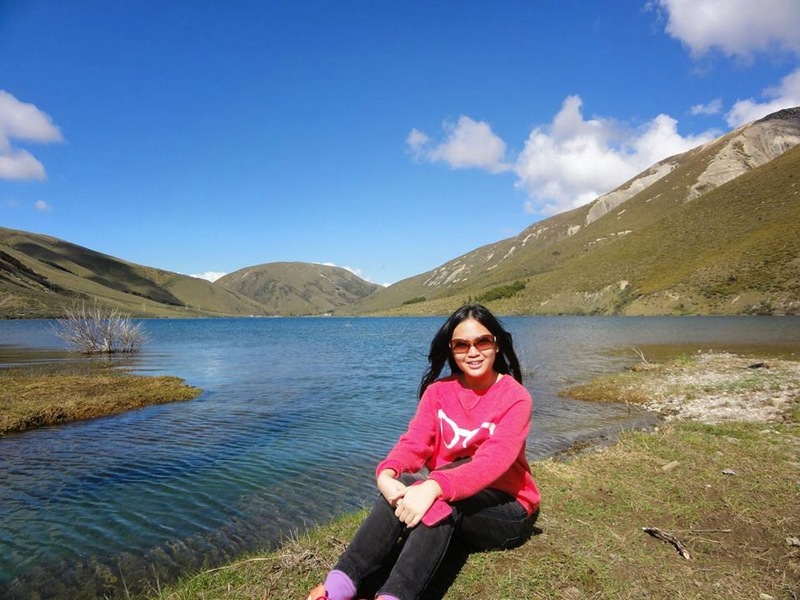 She got the infos and ideas from those blogs she read and also Tripadvisor. She spent months to plan so that everything is well taken care off. After a few rounds of amendments, she finally decided on the route trying to cover as much as possible in South Island. 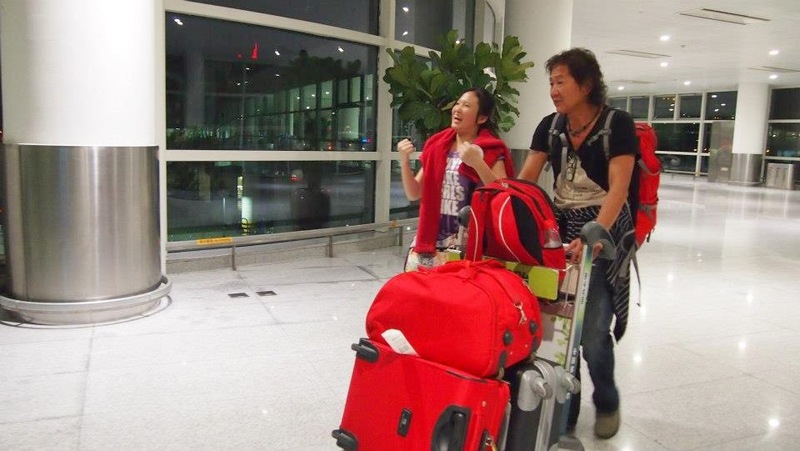 Only when the route was confirmed that she could proceed to book the accommodations which is very important so that everyone could have a good rest at the end of everyday! She opted for motels with cooking facility so that we could cook our dinner instead of eating out to cut cost. In fact, this is what most people do when they travel in NZ. AS usuak, she uses Booking and Agoda for booking. Next she moved to car renting. From http://www.qyer.com/, she learned that Apex Car Rental is reliable and cost effective. To accommodate the 4 of us, she chose Nissan Wingroad Station Wagon which is also the cheapest in the range. 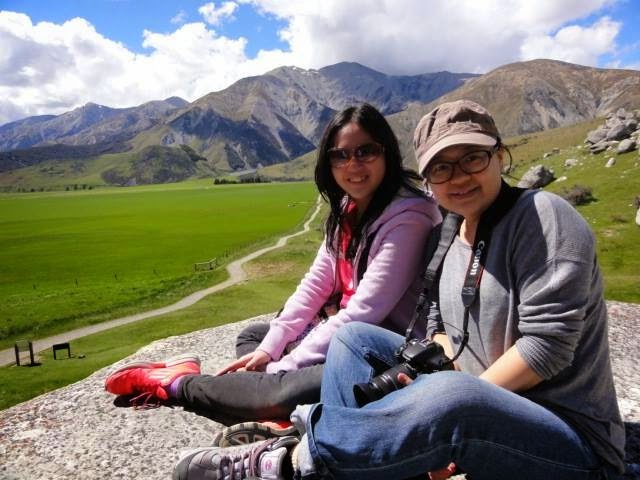 My cousin Tess and her husband Lai, fly SIA from Singapore directly to Christchurch reaching a few hour ahead of us. They get themselves a Ford Focus, also from Apex. This is the plan for the whole trip. Well, I must say that it is quite well planned taking into considerations of all aspects including travelling time, meals time and ample time of sightseeing! This is the last day of our trip. 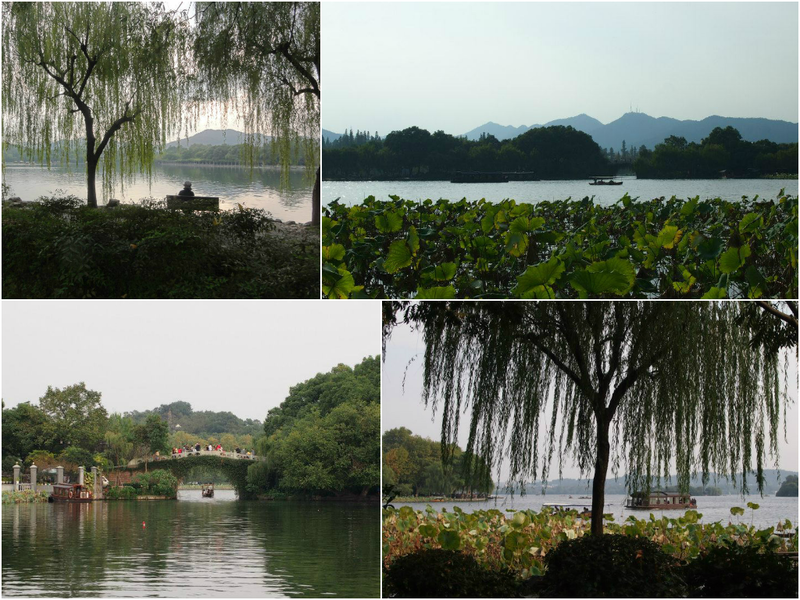 There is only one itinerary, the renowned West Lake which is within walking distance. Our flight is at 1135pm, so there's no need to rush, or so we thought! We had our luggage stored at the hostel before we check out. Once we walked out of the hostel only we realized that the area is a very interesting place itself. We found ourselves in an old charming world! 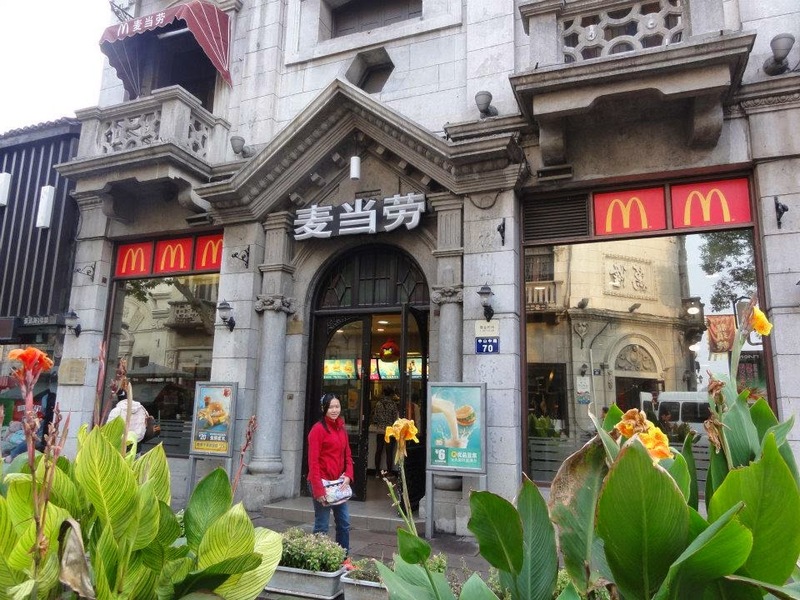 We came upon McDonald in an old building and decided to have our breakfast there. Nice! 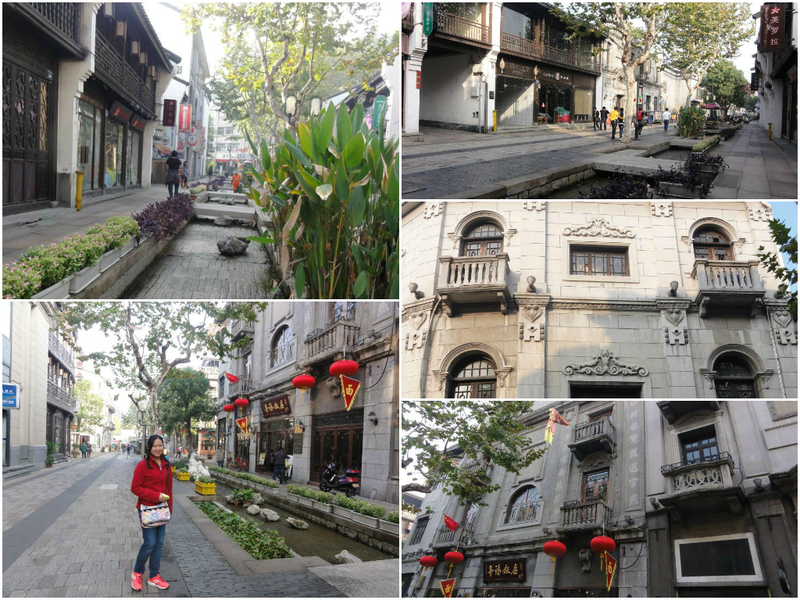 After that, we walked along the road and found ourselves in Hefeng street which is the shopping street of Hangzhou. Typical Chinese shopping street. We continued to walk towards the lake. 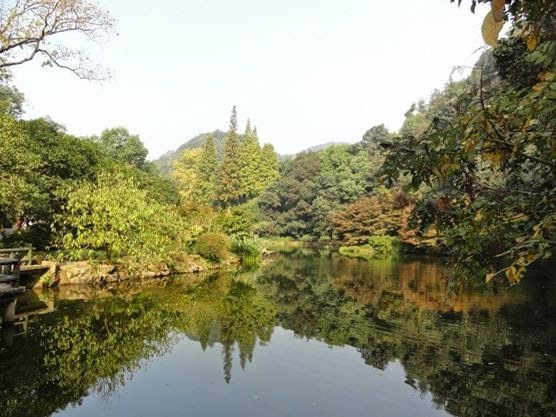 When we were at the junction opposite the bus stop, an old and kind looking woman started to talk to pa. She told Pa that the right way to tour the lake is to start from Jiuxi, then proceed ahead without turning back, tracing the path that was once been walked by the emperor, called the Dragon Path. 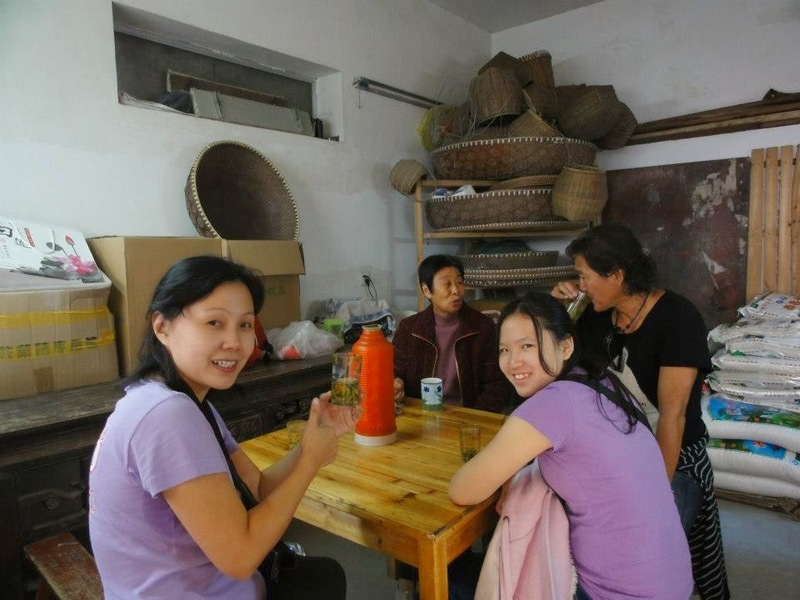 We thanked her and along the way, there was a younger woman, she too told us that we have to start from Jiuxi. So we took the bus as what the old woman suggested. About half an hour later, we reached the terminal. There we got down, hailed a taxi (she called it the Bread Car), about 15mins on, we reached Jiuxi. We walked on and on, finally we reached a small village, and there came another old woman. She kept offering Pa to take a break at her house which is nearby. Pa did not has the heart to turn her down, even with protest from Mum, he accepted and 2 mins later, we were sitting in her house where she eagerly served us tea from her farm. She also offered us her wash room which was exactly what we needed. She was telling us the tea leave from her farm is of high quality and of course we ended buying 2 packs which cost about RM40/pack from her. After that, she helped us to get a private car to send us to a silk factory in the tea farm, the lake was nowhere to be seen. Mum was unhappy as she knew by now that something was not right. Pa quickly stopped a taxi by the road. When the lady driver heard our stories, immediately she said she always knew because no tourist would ended in the area. Thank God that we only bought 2 packs and nothing else!! 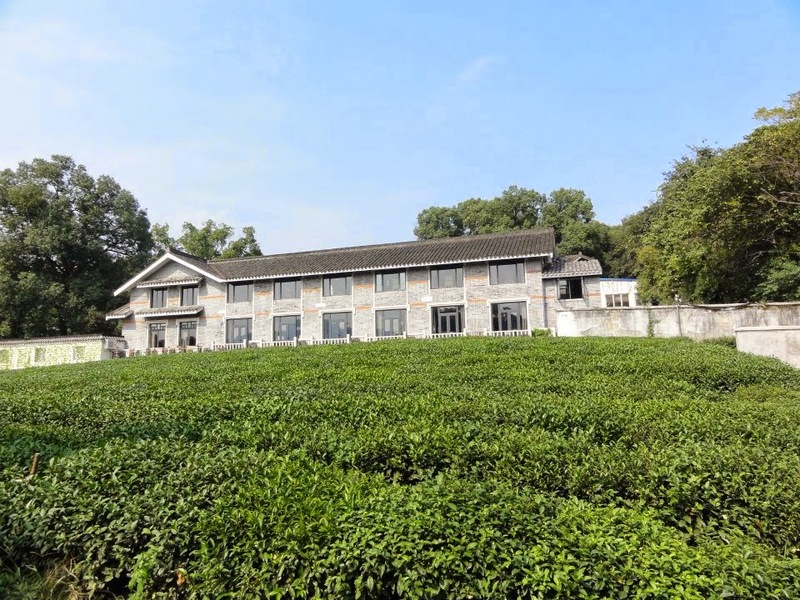 Hangzhou is well known for it's fine Long Jin tea. 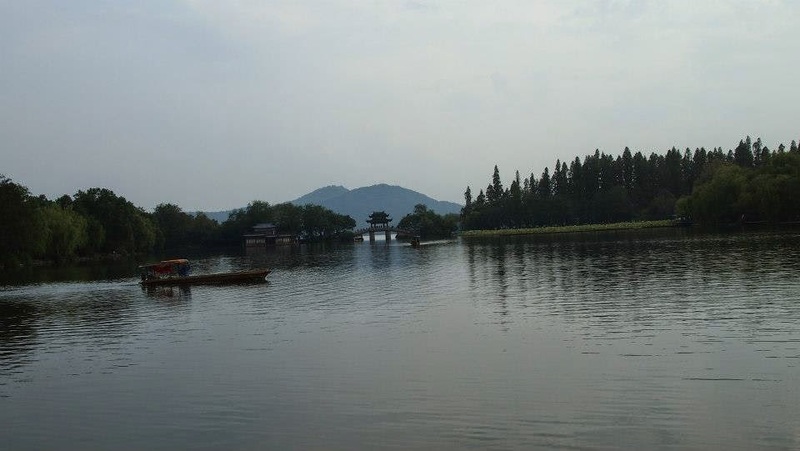 After about 20mins, the taxi finally arrived at the jetty of the very big West Lake. 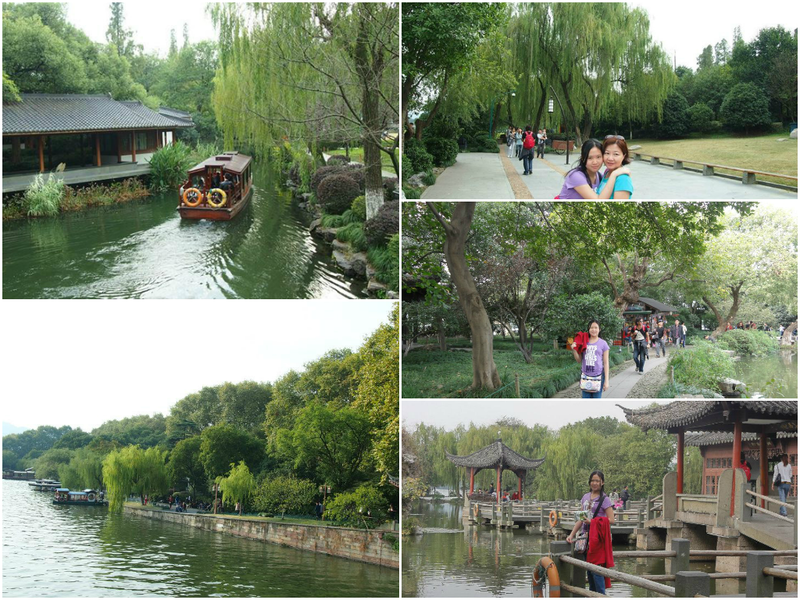 We took the boat ride to the island in the lake. 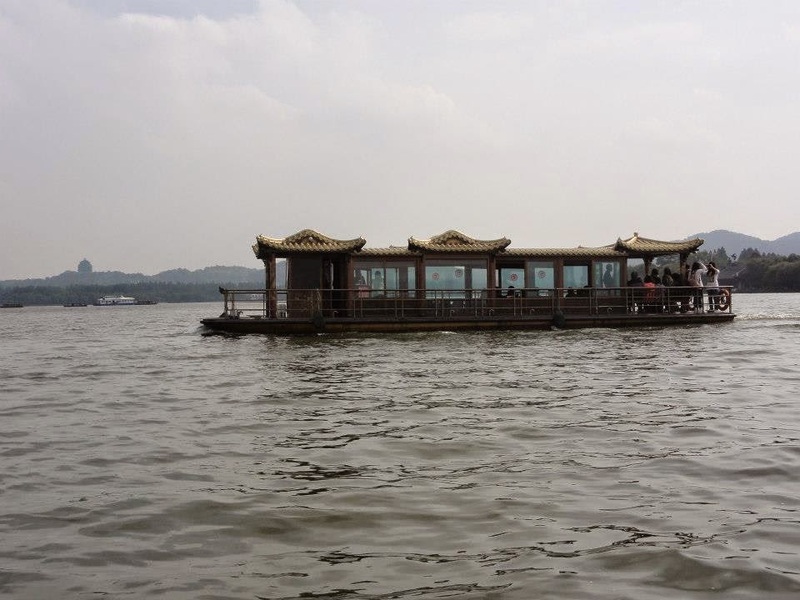 The boats are very unique in beautiful oriental style. 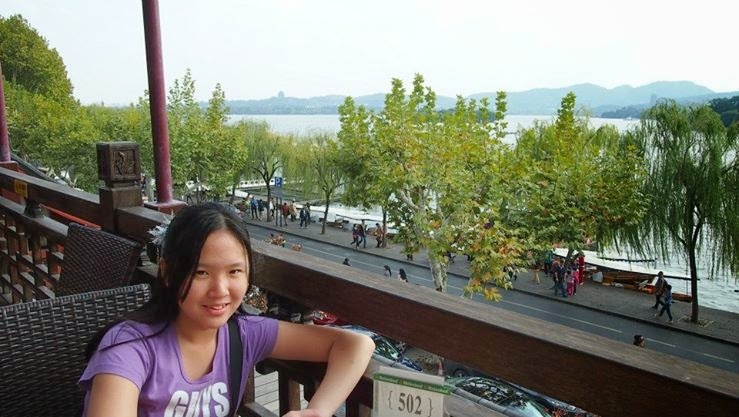 After the boat ride, we had our lunch at a restaurant facing the huge lake. 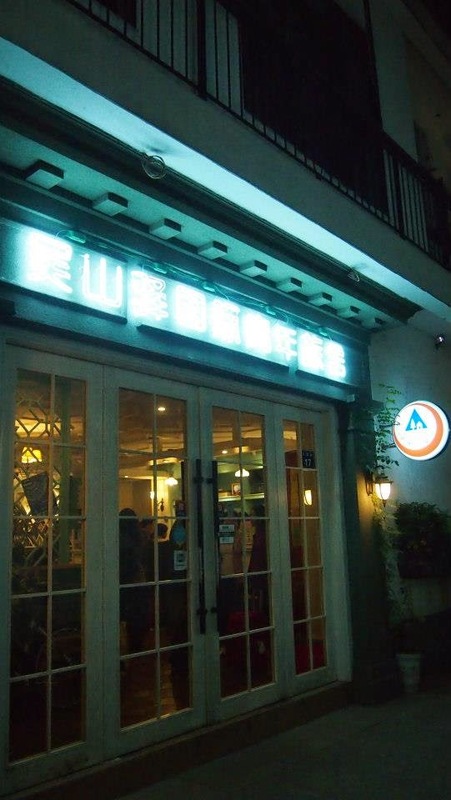 The food served was delicious but the staff were very rude. 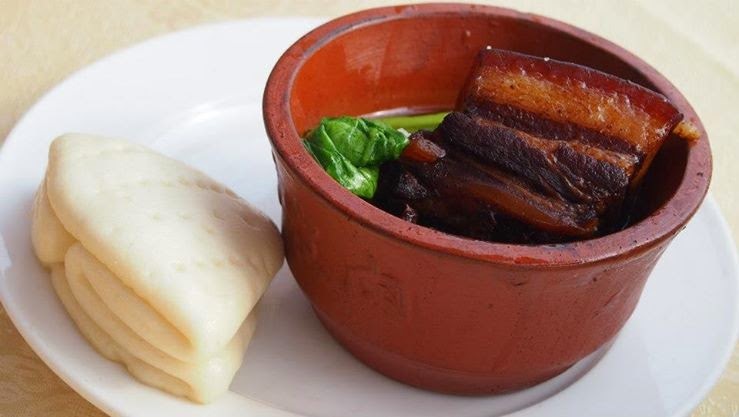 Equally well known is the Pork Tong Por which is really tasty with the bun. We continue to tour the lake after lunch. The weather was hot and the place was full with local tourists and heavy traffic. 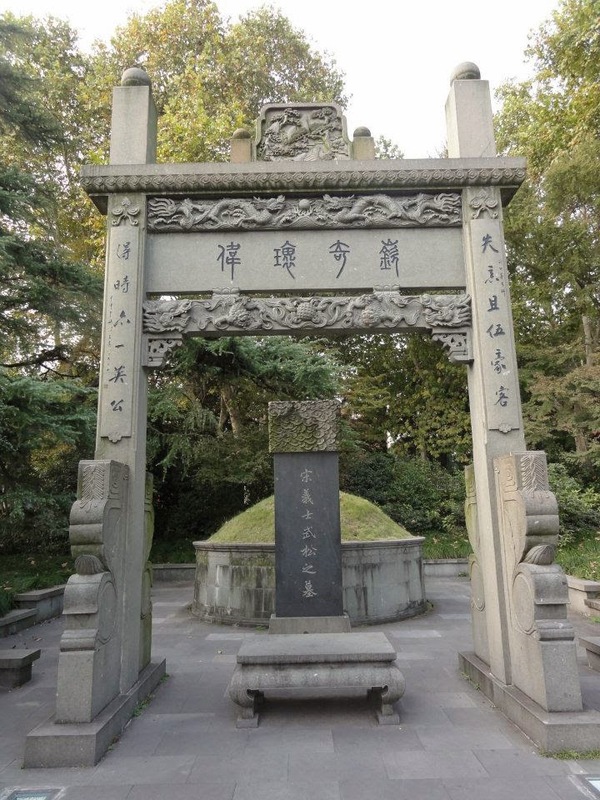 Along the way, we found out that the tomb of famous ancient tiger hero Wu Song is there. 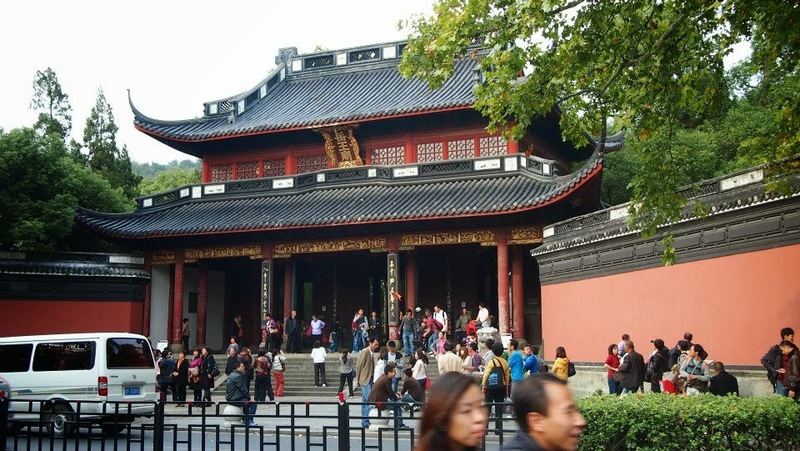 And also found out was tomb of ancient war hero Yue Fei. We skipped the Pagoda Leifung in the end because it was getting late. It was difficult to stop a taxi as the traffic was very busy and congested. Finally a small van which was already full stopped in front of us, the driver insisted he could accommodate us. So we were squeezed like sardine in the tiny van. Obviously it was seriously overloaded, but the best part was the driver sped all the way to the city center. Mum said she was so frighten that she squeezed her eyes shut and she hold so tight that her hands hurt. What a terror ride!! Anyway, we were back to the He Fang shopping street this morning. It was there that we saw loads of tea packs being sold at the price of a mere few rmb, but of course there are different grades of Chinese tea, some even cost thousands! It was another round of hassle when it was time to go to the airport. My heart was pounding hard when time was tickling away. We tried different spots and directions to get taxi, with mercy of god, I thought, finally a taxi stopped. We had our dinner at the airport and had a peaceful flight home. This marks the end of our yearly family trip of 2012. Phew! 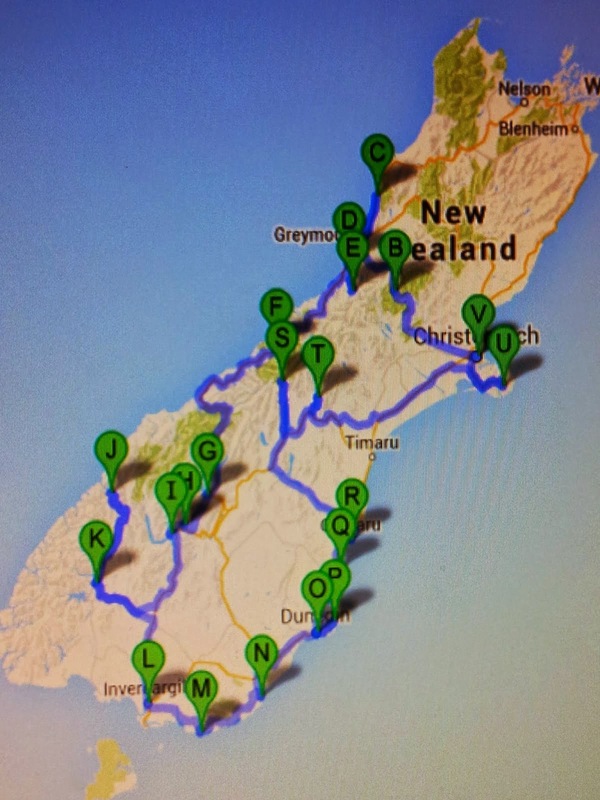 Finally finished the 2012 trip and that means I can start on 2013 trip to NZ which is much much more interesting!! 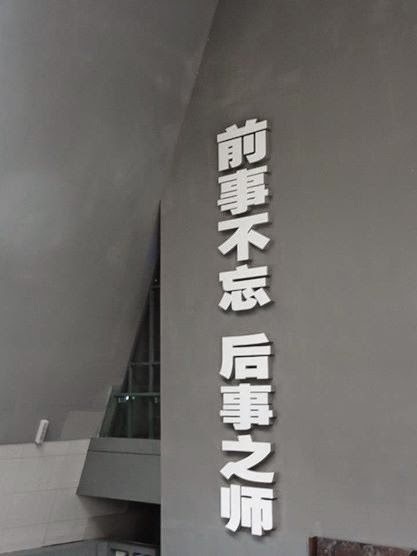 This morning, after our breakfast in the hotel, we took a taxi to Nanjing Massacre Memorial Hall. 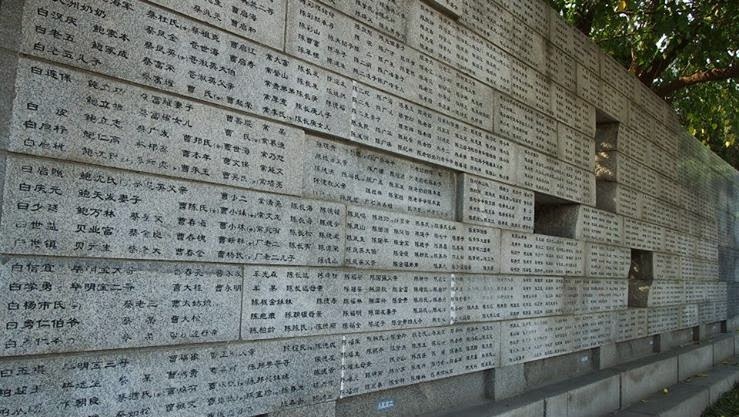 The Massacre happened in 1937 when the Japanese occupied Nanjing which was the capital city of China then. In a short period of a few week, the Japanese massacred about 300,000 Chinese. 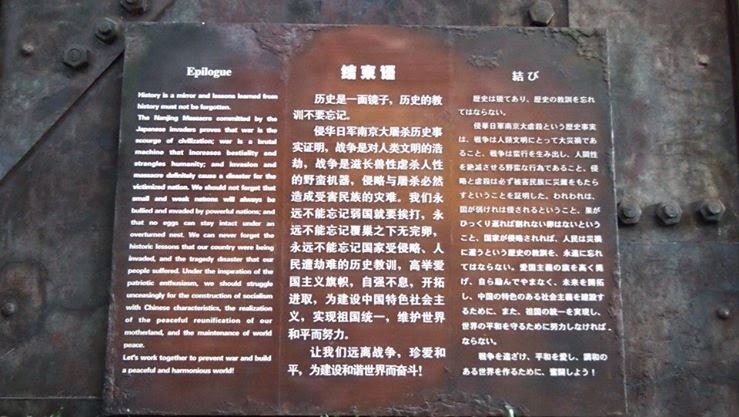 The extreme brutal act had marked a history which is not able to forget and forgive by the Chinese until today. 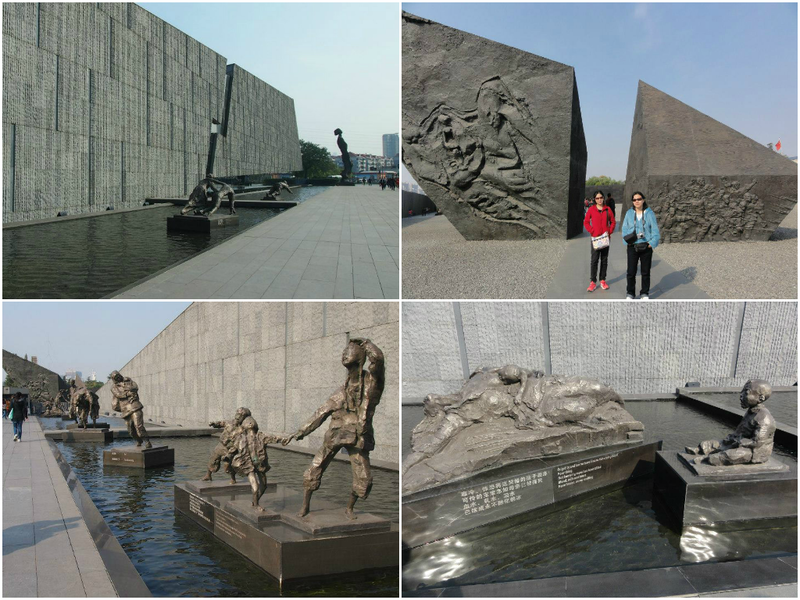 At the entrance, there are sculptures carries messages of stories which made us uncomfortable. It says only death can wash away her filth. Then we reached the site of "the mass Grave of 10,000 Corpses". 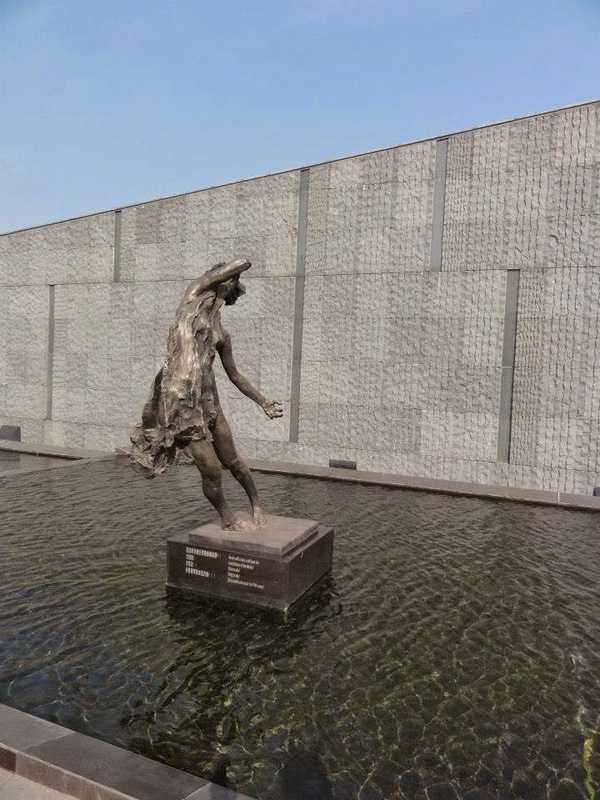 It's the actual mass buried site of about 10,000 corpses. I saw my mum's tearful eyes when she saw the bones of young children. And I also felt my mum's sweating and cold hands. We were getting very uncomfortable as we proceeded further. Next, we found ourselves in the exhibit hall where there were lots of photos and videos showing how brutal the Japanese really were. These images and stories really made us cringed and recoiled. Mum even covered my eyes at some scenes and I could feel her quicken steps. There was even competitions of killing Chinese being held. She just couldn't take it anymore and hurried me along and we were out of the hall. There we sat down and waited for Pa for a long time. 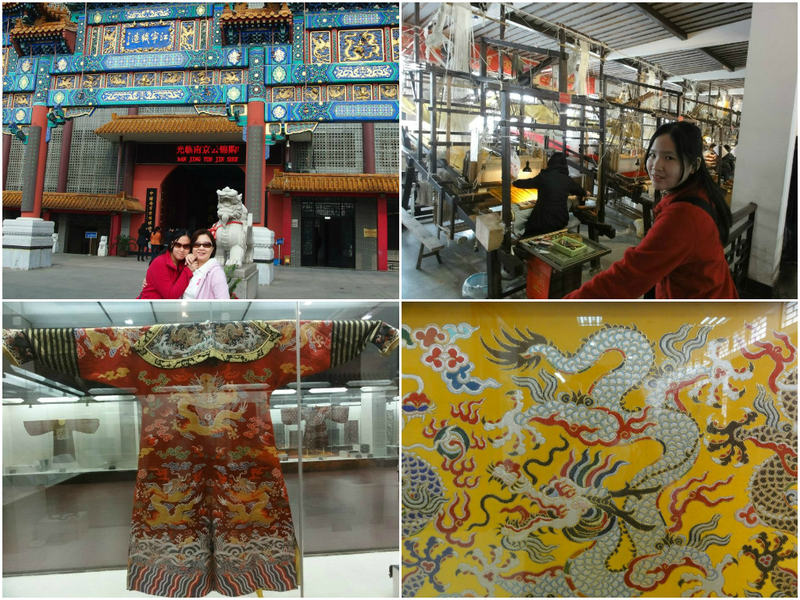 In order to shake off the uneasiness and to bring our spirit up, we went into a silk factory just opposite the hall. There we witness some world class woven master piece! 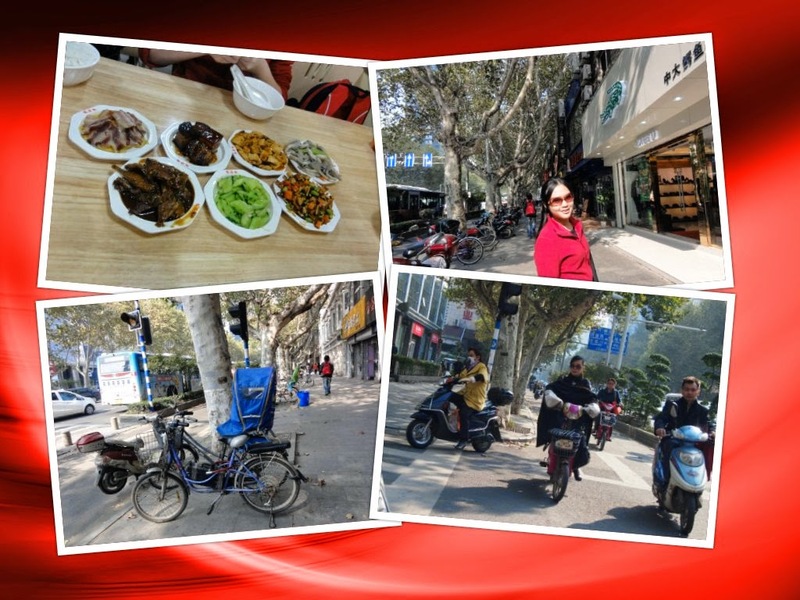 After that, we hailed a taxi to take us back to our hotel where we had our lunch before we went to the train station for our train to Hangzhou. 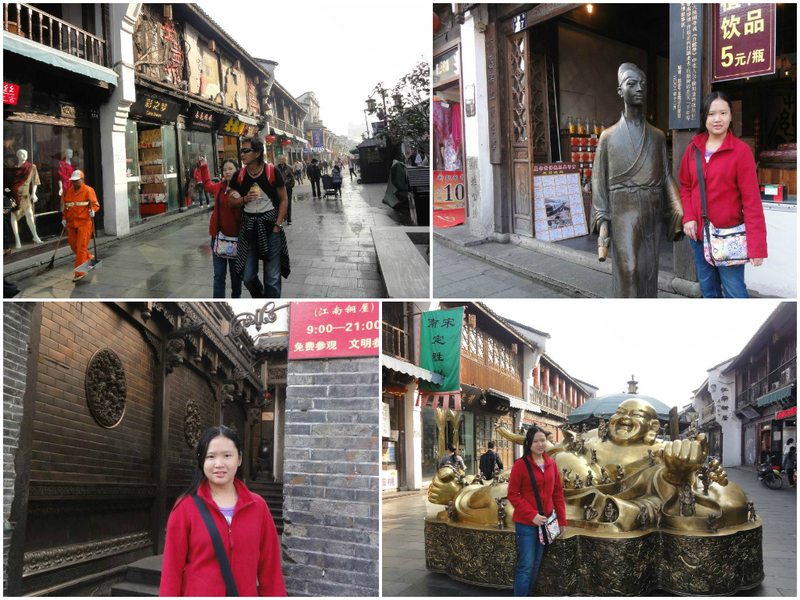 A feel of Nanjing street! 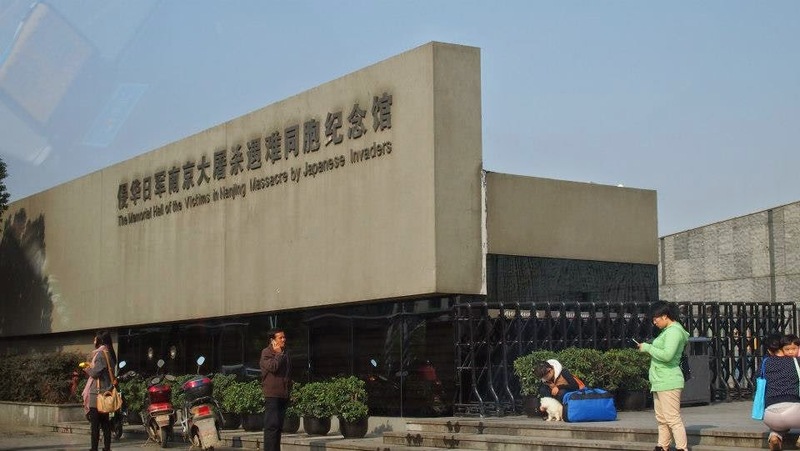 And so after we checked out from the hotel, with the help of the hotel , we took a taxi to the railway station hoping to catch the earliest train to Hangzhou. Unfortunately the tickets were sold out and the earliest train was in the evening! With a few hours to kill, we took a short train ride to a shopping mall nearby as suggested by a local people. As usual, the train was very full and when we were there, the mall happened to be a of a high end mall selling high end stuffs. Moreover, someone had to keep an eye on the luggage as we couldn't be dragging the luggage in the mall. Anyhow, no one was in the mood of shopping at that moment, especially after an unpleasant train ride. So we just sat by the road with the luggage, what a waste of time! 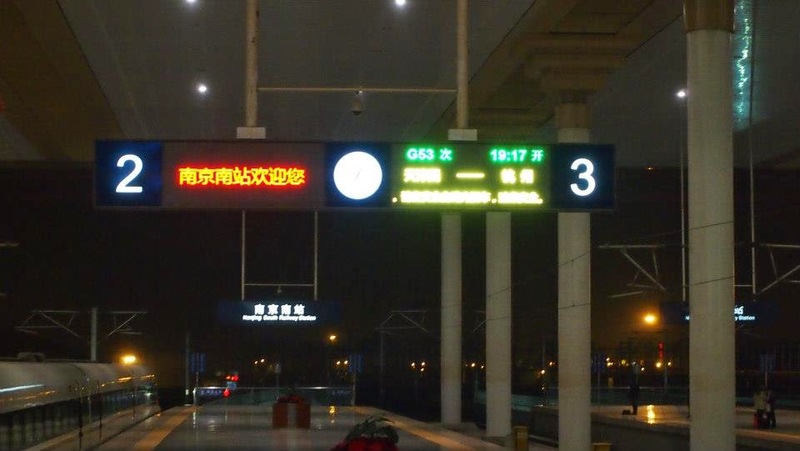 Finally, it was time to board the train to Hangzhou. 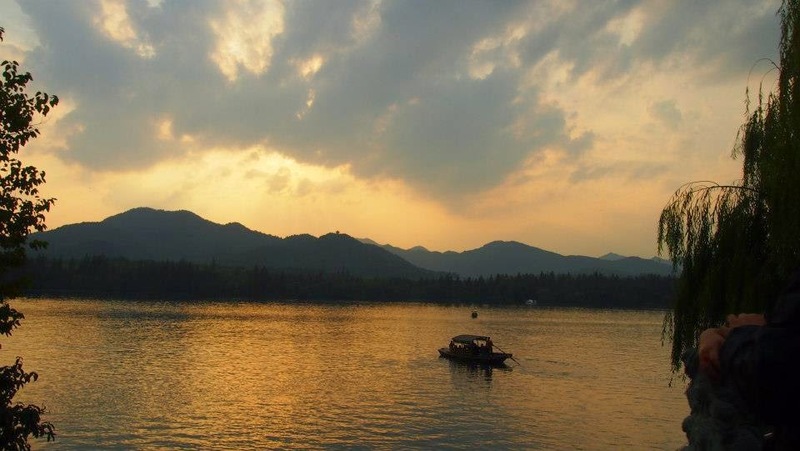 When we reach Hangzhou, it was already late. The station was very crowded and the queue for taxi was long. We were forced to accept a private van offer. The driver said that he knew the way when we told him the name of our accommodation that night. But once we were in the town area, he said he wasn't sure about the way. He was driving around and told us that we had to pay him more. As it was getting really late by now, mum told pa to just pay and ask him drop us someway nearby. Finally, he stopped the van and told us the direction to the hostel. It was dark and deserted as we dragged our luggage walking in the alley. 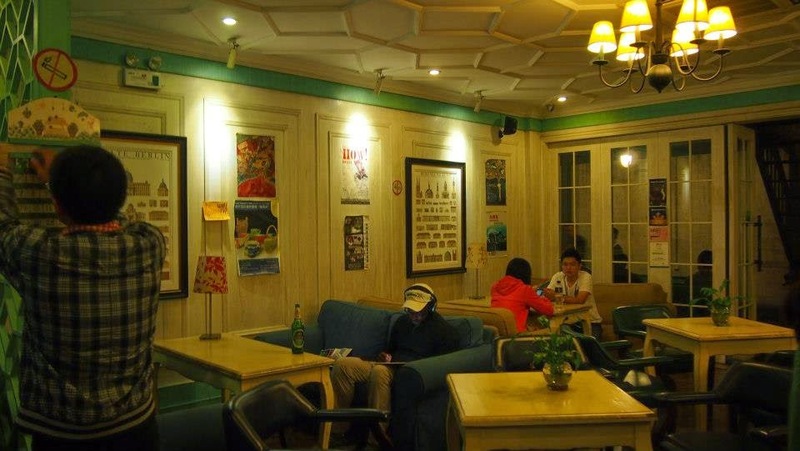 It was only when we saw the signage of the hostel that we were able to let our guts down. It was warm and welcoming! It was mum's idea to stay in the youth hostel as we had not stayed in one before. The hostel is small and there was no lift. We had to take the luggage to the 3rd floor where our room was. We had a bath room attached room which is clean and quite comfortable but the room is extremely small. Along the way, we saw the shared bathroom at the first floor which is quite clean. Anyway, we finally able to take the shower and settled down to rest.